It's getting closer to Christmas. While you are out shopping for gifts, skipping from party to party, I am dreaming of dinner. Every Christmas (and Easter) my family has roast lamb. This year I might buck tradition and serve the king of meats: Prime rib. Prime rib refers to the king of beef cuts, the standing rib roast. It's called this because the roast is positioned on the rib bones in the roasting pan during cooking. You may order prime rib at a restaurant, but that doesn't mean that you are getting USDA Prime (this is where we get the name). Most prime rib we get from the grocery (and restaurants) are actually USDA Choice quality. If you want USDA Prime rib, you will probably need to special order it from your butcher. Why is it allowed to be called "Prime Rib", you ask? Its ubiquitous use is almost like a generic term for this cut of meat. The same goes for London broil. London broil is NOT a cut of beef. It is a style of cooking. A whole standing rib roast (prime rib roast) consists of ribs 6 through 12 in a cow. Estimate 2 people served for every rib.I do NOT recommend purchasing a boneless rib roast, as roasting with the bones adds flavor. 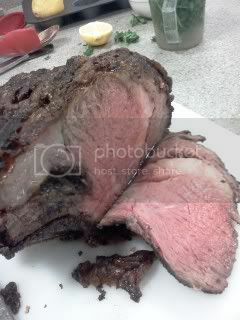 But, if you do purchase a boneless rib roast, cook using the same guidelines as a roast with ribs. This is an expensive piece of meat. Don't be alarmed if you see prices as high as $16/pound (I wouldn't pay more than $10). The money you invest in this rib roast will be well worth it in the end. Have your butcher cut off the chine bones from the bottom of the roast and the rib bones from the meat just along the bone line but do not discard them. They can be cut off in separate pieces or the chine bones can be cut off as one piece with the rib bones (which is my personal favorite). Have the meat placed back on the rib bones and wrap them along with the chine bones to take home to cook along with the roast. Having the bones cut away from the meat before cooking will make carving the finished prime rib a lot easier. Be sure and check the date the prime rib was packaged. 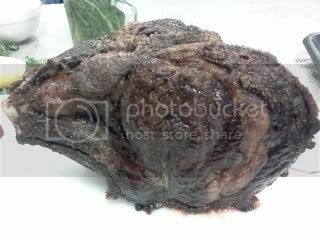 Look at the color of the rib roast; it should have a bright red color and no dry or brown edges. Check for any damage to the packaging and wrapping. Frozen: If your prime rib roast is frozen, let it thaw completely in the refrigerator. Remove the roast from the refrigerator about 2 to 4 hours before cooking to let it come to room temperature. Depending on the size of your roast, the time to come to room temperature may vary. Room Temperature: To cook evenly, the roast must not be cold - let it stand at room temperature, loosely covered, for about 2 to 4 hours. This time can vary. If you don't let the roast come to room temperature, your roast won't cook evenly, and you'll end up with well-done slices on the end and raw meat in the center. Tying Prime Rib: It is important to tie the prime rib before roasting. If left untied, the outer layer of meat will pull away from the rib-eye muscle and overcook. To prevent this, tie the roast at both ends, running the cooking twine parallel to the bone. Most butchers will tie your rib roast for you. Chewing the fat: Your butcher will have already cut off the excess fat from your roast. Do not trim this. The remaining fat (or fat cap) is necessary because as your roast cooks, the fat will melt, keeping your roast moist, seeping into the muscle, imparting flavor, and ultimately creating tasty drippings in the bottom of the pan to be used for later. 1) Remove roast from the refrigerator, loosely wrapped, 3 hours before cooking. Roasts should always be brought close to room temperature first, before they go in the oven. Uneven temperature may cause uneven cooking, this ruining your expensive piece of meat. 2) Preheat your oven to the highest it will go (mine goes to 550°F). Generously sprinkle salt and pepper all over the roast. That's it. That is all you need. No fancy spice mixes, no experimentation with techniques. Save that for the gravy or au jus. 3) Insert a meat thermometer into the thickest part of the roast, making sure it doesn't touch a bone. (Some meat thermometers require that you poke a hole first with a skewer, and then insert the thermometer.) Place the roast, fat side up, rib side down in a roasting pan in the oven. Unless your thermometer is high-heat safe, remove it from your roast. Your pre-made hole will help you gauge temperature throughout the cooking process without juices running, drying out your meat. 4) Place your roast in the oven for 15 minutes. After 15 minutes on 550°F, reduce the heat to 325°F. To figure out the total cooking time, allow about 13-15 minutes per pound for rare and 15-17 minutes per pound for medium rare. Roast in oven until thermometer registers 115°-120°F for rare or 125°-130°F for medium. Check the temperature of the roast using a meat thermometer a half hour before you expect the roast to be done. For example, with a 10 pound roast, you would expect 2 1/2 hours of total cooking time (15 minutes at 500° and 2 1/4 hours at 325°). In this case, check after 2 hours of total cooking time, or 1 hour 45 minutes after you lowered the oven temp to 325°. Once the roast has reached the desired internal temperature, remove it from oven and let rest 20 minutes, covered with aluminum foil, before carving. The roast will continue to cook while it is resting. Why rare? Why medium rare? The texture and flavor of this cut of beef is best at these temperatures. Cooked any more, and you have essentially ruined an expensive cut of beef. If you are squeamish about medium-cooked beef, do not attempt this method. Stick to steaks and other parts of the loin. I was at Nikki's cooking class when she pulled this roast out of the oven. It was the best prime rib (or standing rib, if you want to be precise) I've ever tasted. Thank you for all of the tips! Your prime rib looks amazing! Yum.